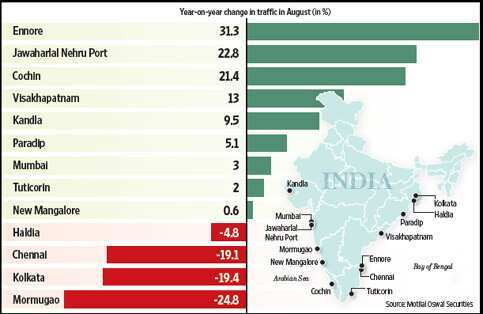 Amid endless debates about a slowdown in Indian economy, August cargo traffic rose 3.6% year-on-year in ports. Fiscal year till date, traffic was up 4.6% from a year ago, driven by liquid and container cargo. The chart shows that of the nine ports where traffic grew, Ennore and Jawaharlal Nehru ports were the most active—container, and petroleum, oil and lubricants boosted volumes. Mormugao port registered the biggest drop.